The "Nice Guys" of OK Cupid wags a finger at dating site members who claim to be nice guys but are anything but. 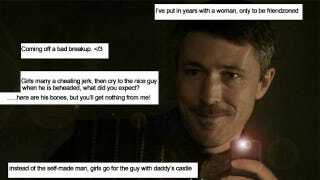 Nice Guys of Westeros is a brilliant goof on that concept, excerpting the imaginary dating profiles of Game of Thrones' not-so-charming bachelors. The Tumblr also has profiles for Jorah Mormont, Viserys Targaryen, and Xaro Xoan Daxos. So far, Hodor is sounding like the most datable character.